The 5th of January marked the auspicious day (according to the Hindu Calendar) of 'Vaikunth Ekadashi' (Vaikunth - Paradise, ekadashi.. The 11th day of the lunar cycle). As per Hindu tradition, this day signifies 'open house' in the Lord's abode when anyone leaving the mortal world to meet their Maker is assured of salvation, free of the cycle of birth & death. The day is marked by prayer and fasting. Perhaps the best way to explain the significance of this tradition is to refer to Devdutt Pattanaik's article on the topic. But unlike other occasions, the fast is not broken by decadent culinary offerings but with a simple pepper flavored gravy, plain rice and a stir fry made with the leaves of the hummingbird tree (Sesbania grandiflora). Known as 'Agathi Keerai' in the Tamil language, it finds applications in Southern Indian & Thai cuisine. 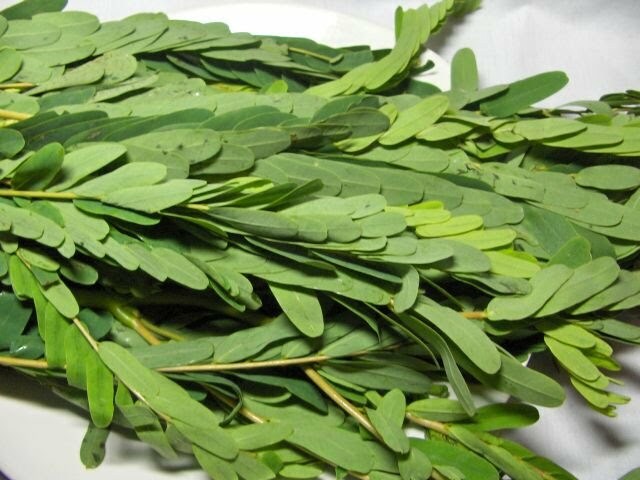 The texture of the leaves is somewhat leathery and to be frank, it is an acquired taste, almost eaten because of tradition rather than preference. Its more of a textural treat than taste, but sometimes, it becomes nostalgic, and when craving sets in, inventiveness sets out to find a suitable substitute. 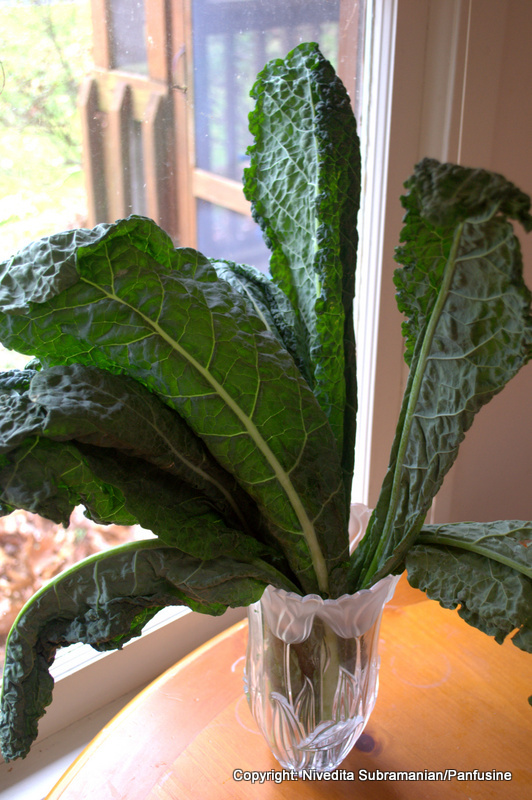 I had picked up a bunch of Dinosaur Kale (a.k.a lacinato, Tuscan, or black Kale, but calling it by a prehistoric moniker makes it sound like fun! ), not knowing what I was going to do with it, when I got a call from a dear friend from Mumbai, Jayashri. As is bound to happen, during the course of our hour long chat, she happened to mention Agathi keerai & also describe her mother-in-law's recipe technique. Inevitably, that set off a wave of homesick longing for a comfort food & the Kale's fate was sealed, deliciously it turns out! 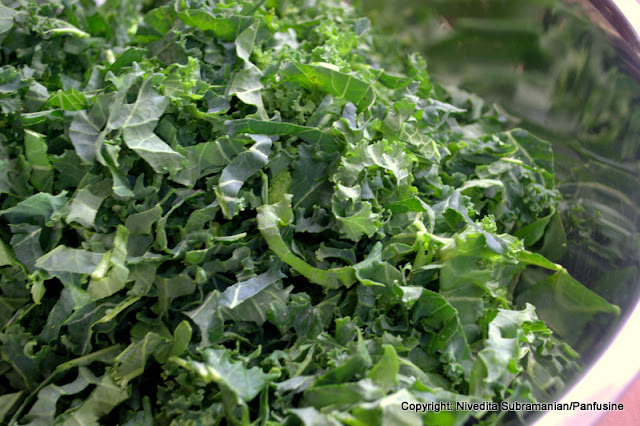 Wash the Kale leaves, remove & discard the thick central vein. roll up and chop the kale into small bits. In a Saucepan, bring 2 cups of water to boil and add the yellow mung dal. Cook until the mung dal is soft and cooked through, but not mushy. Drain the water and reserve the mung dal. In a large skillet, heat the oil till almost smoking. Add the Mustard seeds to sputter, followed by the Urad dal and the broken arbol chile. When the Urad dals begins to turn pinkish brown, add the asafetida & the torn curry leaves. Stir to combine and add the chopped kale. Saute till the leaves wilt and soften. Add the salt, cook for about 2-3 minutes more and then add the cooked mung. Stir to combine, and cook on medium heat till all the water (exuded by the greens) evaporate. Stir in the grated coconut, leave on heat for about a mnute more, and then transfer to a serving dish. Serve warm as a side to traditional South Indian fare such as Rice & Sambhar. 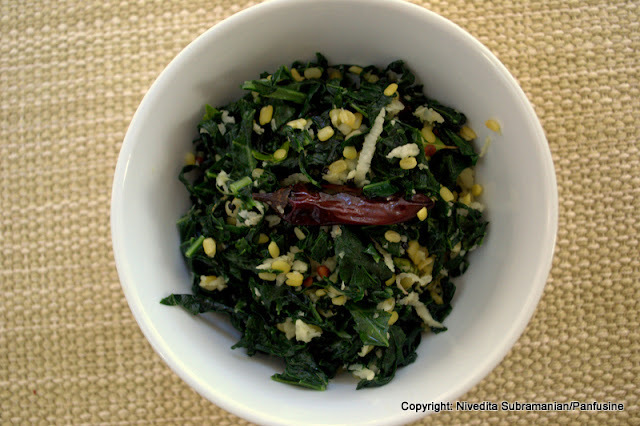 The only thing I have tried with kale is the "Haak" from Jugalbandi via Anita and then putting in my Dal. 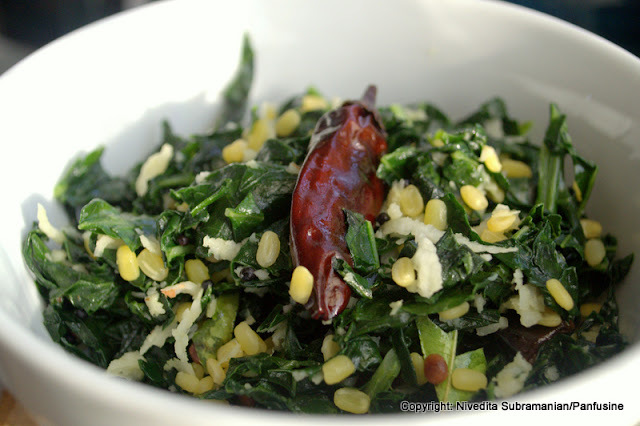 I have had this South Indian stir fry with greens, not with Kale though. Sounds healthy and delish. I've never tasted kale so far. Jayashree, believe it or not, Until 2 months back, neither had I, (I've always seen it stacked up in cheesy deli stores as a garnish around the food), but Kale really ROCKS! Kale stir fry looks good, we get some organic kale here but don't actually know what variety it is. I am more curious about this agasti leaves, I have had curry and pakode made with the flowers and buds but never knew the leaves are edible too. Thanks for introducing them to me. Kale thoran - my favorite! I love everything Kale actually. Have you tried oven-roasted kale? It is better than potato chips :) BTW, I think it is my first time here,great space you have! Hi - I'm happy to discover your blog! I love your recipes on Food52. I plan to make this kale dish today. We love Indian food (particularly South Indian) and I think it will be a hit! I happened to find your blog (not sure how or where), and when I found this recipe, it stopped me in my tracks, as I had every ingredient on hand. So of course, at 9:35 a.m., I scampered off to make a batch! Carrot Halwa Blondie Bars - an Update.. 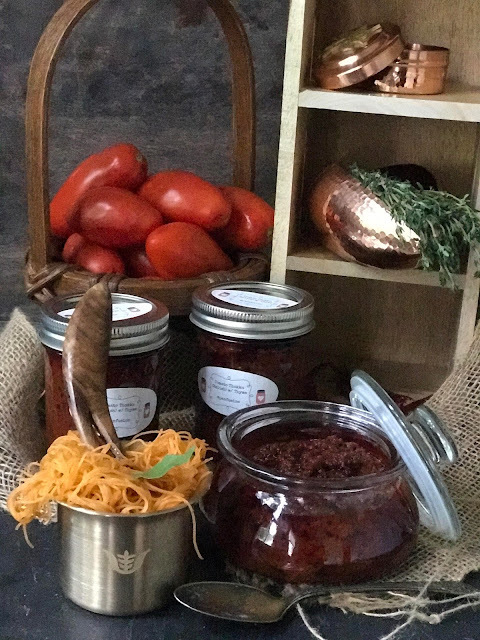 Taste from Waste - Cauliflower stem relish!